When I visit a new city, I like to learn a bit about its history — so I hope you’ll indulge a brief history of Bruges. No one knows exactly when Bruges was founded, but we do know that there was already a fortified settlement here when Julius Caesar and his troops arrived. Trade between England and Scandinavia took off in the 9th century, and by 1100 Bruges was well established as a market town. On July 27, 1128 Bruges — or Brugge, in Flemish — officially became a city. The medieval gates still stand, though today they bring cars into the city instead of trade. Bruges’ early residents were shrewd financial innovators. In 1309 they established the world’s first stock market, which created an explosion of trade and commerce. 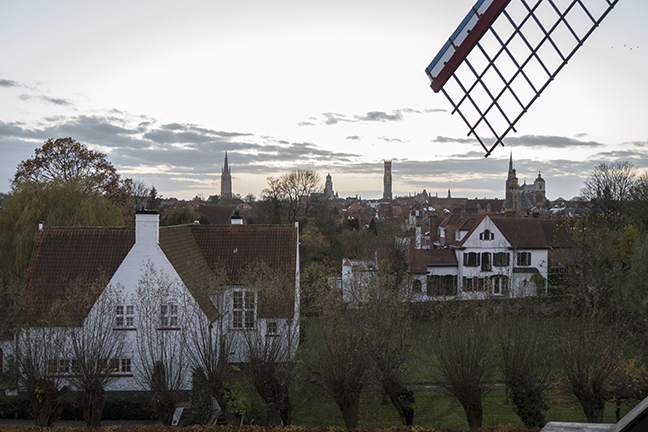 At its height, Bruges had more than 200,000 residents — one of the largest populations in medieval Europe. But Bruges’ economy began to collapse in the 1500s when silt started accumulating in the Zwin channel. Trade declined as access to the sea was cut off, and by the 1900s Bruges’ population had dropped to only 50,000. Ironically, Bruges’ decline helped preserve its charm: Without capital to renovate and rebuild, the city was effectively frozen in time. Walking through the city today probably feels much like it did 500 years ago. Because the terrain is flat — and because most of the houses are only two or three stories tall — the churches’ spires seem to tower over the city. Likewise, the medieval Belfry of Bruges (the Belfort) feels omnipresent. Begun in the late 1200s, the tower got its iconic octagonal parapet in 1486. It was intended in part as a fire lookout, but ironically, it burned in 1493. In was rebuilt, only to burn again in 1791. The version of the eight-sided summit we see today dates from the early 1800s. We also visited some of the grand monuments, which were indeed impressive. … and basking in the silence that becalmed the city every evening. Previous … aaaaand we’re off! This town is absolutely worth for a visit! We have not been there, but Your post, it gives an idea to visit this place sometimes. Thank You. Oh, but you MUST visit Bruges sometime! I can only imagine how beautiful it would be through your lens — and there is so much history everywhere you look. I hope you can visit someday, because I think you would enjoy it immensely.